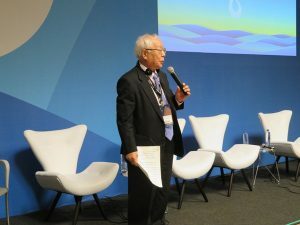 Japan Water Forum has been actively engaged in the thematic process of the 8th World Water Forum, Brasilia. 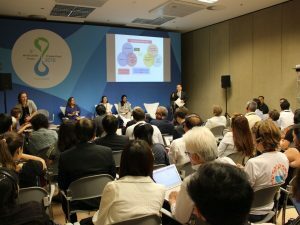 It took a leading role of session coordination of "Involving All Through a Stakeholder Driven Process" and also made a significant contribution to the different sessions under the theme of "CLIMATE", "DEVELOPMENT", "URBAN", and "SHARING" by sharing Japan's experiences. Lead Organization of the Session Coordination Group - Session, "Involving All Through a Stakeholder Driven Process"
1. "Involving All Through a Stakeholder Driven Process"
The session has attracted a large audience, more than 60 people. The key messages and recommendations derived from the active discussion at the session will be incorporated into the outcome document of the 8th World Water Forum. “Involving All” during the entire process of water management is a key to sound decision-making for better water management and more efforts are needed to have stakeholders engaged and empowered. - Building an effective mechanism allowing any types of stakeholders to be equally involved in the process requires a long-term commitment at all levels. - The more stakeholders are involved, the more difficult it could be to reach a consensus or to make a decision. An “Involving all” can bring the good results in the long run including ensuring ownership and long-term sustainability of solutions. Political will promoting stakeholders’ engagement is required and the governments need to be flexible in order to have dialogues and consultations lead to real influence on the development process. Setting up legal/institutional frameworks alone is not enough to be the solution unless they operate properly. It also requires best efforts on awareness-raising, communication, capacity building, and financing. Those who facilitate continued dialogues and coordinate the interests of different stakeholders are needed. Effective involvement of and collaboration among stakeholders with clearly defined responsibilities and accountabilities, sharing the burden and benefits are required for sustainable water management.